Syrah House is a very large 2 bedroom 2 1/2 bath two-story contemporary home that comfortably sleeps 4 people. It is perfect for 2 couples or a small family. The bedrooms are located on different floors which creates a nice amount of privacy. The first floor features living room, dining room, kitchen, powder room and master bedroom with an ensuite bathroom. The master bedroom is 400 sq ft, has a California king bed and large flat screen tv. Cooks will love the spacious kitchen with plentiful counter space and preparation areas. Equipped with a Wolf gas range, double ovens, large sinks and a walk-in pantry, it has absolutely everything you need to prepare a wonderful meal. Up a broad staircase is the second level. There you will find the other bedroom that has a California king bed, private bathroom and a media/recreation room featuring a big-screen TV/DVD with two couches for comfortable viewing. A section of the upper floor has exercise equipment and a Foosball tabletop. Keywords: 2 Bedroom, Gourmet Kitchen, Family Room, Living Room, Dining Room, Extremely clean and very well landscaped. 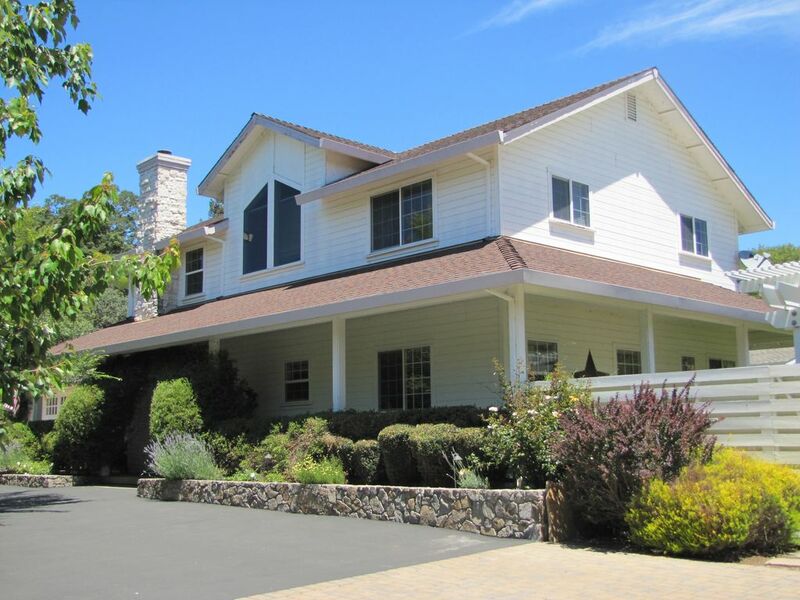 We have lived in Sonoma Valley for more then 25 years. We own and operate California Wine Tours, the areas #1 wine tour company. We enjoy sharing with visitors all our beautiful wine country has to offer. Whether you are chauffeur driven by one of our expert tour guides or self driven we have several great itineraries and activities to choose from, just ask! The Wine Country has a lot to offer but when it comes to where we wanted to buy the decision was easy, Sonoma Valley is the best. Hands down! One of the best benefits of the rental is it's size. It's larger then most 2 bedroom houses out there. It's 2700 sq feet and is very private. The location is also a plus, only 5 minutes to the downtown plaza and 5 minutes to the wineries. Flagstone Patio with Hot Tub and Dinning area. We had a great stay. Hidden Gem is a beautiful spacious home and a very convenient location. Very nice , clean and owners very responsive to our needs, would highly recommended this property. House was clean and nicely appointed nice private property With private gate, in a nice area close to city center. It was perfect for our stay. We enjoyed all the conveniences of home, plus more! Valerie and Michael have a wonderful rental! The location was ideal and the house was fully equipped to make our stay comfortable. We were able to communicate with them easily. We loved the big king sized beds, too. Very comfortable! The back yard area was beautiful and we enjoyed the hot tub very much! So comfortable and plenty of room! Roomy, clean and well appointed. Somewhat dated but well kept. Upstairs area is almost like a second apartment. Comfortable beds. Grounds are lush and beautiful. Fairly close to Sonoma - about a 5 minute drive to town square yet in a very quiet area. The owner did not meet me at property when I arrived, which is not great but I was okay with it as it was getting late. When I struggled with the entry gate key pad upon arrival, the owner talked me through it on the phone. We had a great stay and enjoyed the property and Sonoma wine country. Special packages in conjuction with "California Wine Tours" the areas #1 leader in Wine Country Tours and Transportation. Cancellation notice must be received at least 60 days prior to your scheduled arrival in order to receive a refund less our $100 processing fee. Cancellations received less than 60 days prior to your scheduled arrival will be 100% non-refundable – no credits will be given for future bookings. If your payments are broken into multiple payments and one of these payments is not received within 72 hours of the due date the reservation will be cancelled and the moneys paid will be forfeited.